Some things don't get better with age. Wine does, Big Star doesn't. Alex Chilton and Jody Stephens will never make another record like the classic Big Star records #1 Record and Radio City. 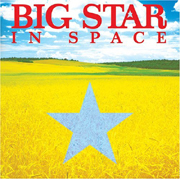 So, it is with disappointment most will listen to In Space, the first new Big Star record since 1978's ill-fated Third/Sister Lovers. However, fans of The Posies will dig In Space, partially because Jon Auer and Ken Stringfellow, the songwriting team behind The Posies, along with Chilton and Stephens comprise the new Big Star. Gone from Big Star's sound is the Memphis R&B and garage-rock that, coupled with their power-pop, made them legends. All that is left is power-pop. And, as a power-pop record In Space is quite solid (thus, Posies fans will dig it). "Best Chance We've Ever Had" (a Stephens-penned number) is glowing, bubbling pop music with a nice rock appetite, and "February's Quiet" (the other Stephens-penned number) delves slightly into the garage-rock side of things, which makes it a refreshing cut on this Big Star album. However, then tracks like the funky "Love Revolution" come along and kill the mood. There is the R&B-soaked "A Whole New Thing", which makes you think Chilton still has it in him, but he seems more comfortable (and happy) creating solid pop songs like the AM radio throwback "Hung Up with Summer". Fans of Chilton's solo work will dig In Space, because Chilton's pop ability hasn't been this good in the past twenty years. But, come and expect a Big Star record and you won't get it. Expect an Alex Chilton record written with the help of The Posies and you'll get a nice pop treat. I'll give it a B+.